The allure of Tropical North Queensland is undeniable – swaying palms, empty beaches, otherworldly rainforest filled with cascading waterfalls and the world’s largest coral reef right on your doorstep. Linked by an incredible scenic coastal drive, Cairns and Port Douglas are undoubtedly the most well-known choices for holidaymakers and with similar activities on offer it can be a challenge choosing which to pick for your paradise getaway. Each has its own charm and character and the below comparisons will help you decide if it’s better to jump off from Cairns or head for the seaside village of Port Douglas. Almost 30 tour boats depart for the Great Barrier Reef from your doorstep each day, giving you the greatest range of boats and experiences to choose from. Families can enjoy a day at Fitzroy Island, Green Island or the number of pontoons on the outer reef, including the Great Barrier Reef’s only waterslide, while experienced divers have an enviable selection of specialised vessels to choose from, like Divers Den who showcases fluorescent corals under the moonlight on their overnight liveaboard experience. Cairns also features the only Indigenous tour on the reef, Dreamtime Dive & Snorkel, where not only can you experience the Great Barrier Reef in all its glory, but learn the cultural significance of the system as well. Anyone possessing or looking to get their PADI should consider jumping aboard a liveaboard with vessels departing from Cairns only. The offering on each liveaboard varies wildly but they’re a perfect fit for anyone serious about their diving, with more dives completed and dive sites visited than any day trip. Unlike day tours, overnight divers also witness the significant difference in marine life on a night dive and wake to see the flourish of morning activity on the reef with an early morning dive. The biodiversity of the coral reefs from Port Douglas are praised as being among the best in North Queensland with many boats visiting sites along the edge of the continental shelf at Agincourt Reef, on the lower part of the famed Ribbon Reefs network. Here, the water clarity is typically clearer than its inner reef counterparts. Between July and September, Agincourt Reef is frequented by dwarf minke whales whom only certain tour operators have permits to dive with including Silversonic, taking guests to three sites daily. Port Douglas is also the closest departure point for the Great Barrier Reef and includes over a dozen tour operators. The Low Isles are a short 30min boat cruise from the marina where guests can explore the coral cay on foot or snorkel fringing reefs on a half day cruise. Soar above the canopy over trees that appear to fade into the abyss of undergrowth like a scene from a fairytale with Skyrail Rainforest Cableway. Located only 20mins north of Cairns CBD, Skyrail takes you into the world that inspired Avatar and through rainforest boardwalks peppered with informative plaques about native wildlife and the World Heritage landscape. Disembark at Kuranda and explore this charming village in the rainforest alive with the hustle and bustle of marketplaces, cafes and wildlife parks. Cool down in the freshwater pools of Crystal Cascades or Stoney Creek both a short distance from the heart of the city, or venture south to Behana Gorge for a beautiful waterfall flowing from Queensland’s second highest range. Within walking distance of Cairns is the Mount Whitfield Conservation Park featuring a network of walking trails through rainforest-clad slopes located right by the tropical Cairns Botanic Gardens. Undoubtedly the most famed area of the region’s rainforest is the Daintree and Cape Tribulation, lying north of Port Douglas. Disconnect from the modern world – really, your phone is but a camera here – and reconnect with nature as you wander through the prehistoric jungle, possibly spotting the elusive cassowary. Zipline through the canopy with Jungle Surfing or explore the rainforest from elevated walkways at Daintree Discovery Centre. Day trips depart from Port Douglas daily or self-drive and explore at your own pace. Approximately 20mins from Port Douglas lies Mossman Gorge, the jewel of the Daintree. With its pristine waters and mossy boulders, plunge in for a swim before taking a guided Ngadiku Dreamtime Walk to learn the traditional use of plants from the people whose descendants have inhabited the area for tens of thousands of years. As the Tropical North’s “capital”, expect to find a range of establishments from classy rooftop bars, hidden whisky parlours, relaxed waterfront beer gardens and a measure of vibrant night clubs amongst historic pubs. Somewhat of an institution in Cairns is the Salt House set along the Marlin Marina; famous for cocktails, their espresso martini is a welcome pick-me-up before a night out. Take in the days last rays perched at Cairns’ highest bar Rocco, with an extensive wine list to savour while enjoying the panoramic vista over Cairns Esplanade, followed by a bar hop between Cairns’ smaller establishments or a beer at Hemingway’s Brewery at the Cairns Wharf. More laid back in terms of nightlife, Port Douglas still packs a punch with its selection of bars and restaurants. Conjuring images of palm trees and blue seas, Barbados offers a sophisticated spin on a Carribean cocktail bar serving rum cocktails and tasty food overlooking the Dickson Inlet. For a casual drink to two, visit the original Hemingway’s Brewery at the Crystalbrook Superyacht Marina serving up the finest handcrafted beers made on site. Whilst Port Douglas is more inclined to quiet drink establishments, party-goers can find solace at Paddy’s Irish Pub or IronBar, which transforms itself into a party-haven after dinner with live bands and DJs and cane toad racing. For a quieter evening out, check out Jimmy Rum’s Mixing Lounge, a dark and mysterious prohibition style bar with an impressive selection of speciality drinks. While the city itself doesn’t feature sandy shores, smack-bang in the middle of town is the Cairns Esplanade Lagoon, a thriving hotspot on the waterfront featuring a public 4,800m² saltwater swimming pool surrounded by free barbeques. A number of beaches lay just north of Cairns, easily accessible by car or bus. These are mostly sleepy suburban beaches each with their own character and frequented mostly by locals. Yorkey’s Knob is a favoured kite-surfing destination, Trinity Beach attracts those wishing to laze on the beach in the shade while others venture to the Kewarra Beach Shack for pizza and drinks on the sand. Stretching along the length of the township of Port Douglas, Four Mile Beach is a convenient distance from wherever your hotel may lie. As its name suggests, Four Mile Beach is expansive so finding yourself an isolated spot on the sand is done with ease. If you fancy a swim, the lifeguard patrolled area has sun loungers and umbrellas for hire and is in close proximity to the vibrant town centre filled with cafes, restaurants and ice cream parlours. Beginning near the swimming area, a short walk up Flagstaff Hill will greet you with expansive views over Four Mile Beach and the Coral Sea. For a beach experience unlike any other, Walkabout Cultural Adventures will pick you up from Port Douglas and take you on a short drive north to Cooya Beach. Here you will learn the traditional hunting methods of the local Kuku Yalanji people and try your hand at hunting for mud crabs. As far as a regional city goes, Cairns is a buzzing metropolis with an array of restaurants and cafes. Feast upon fresh seafood aboard a converted fishing trawler at Prawn Star docked at Marlin Marina or dine on local produce in style at Ochre Restaurant. Each Friday to Sunday, fresh produce stalls and eateries appear in the heart of Cairns at Rusty’s Markets, overflowing with tropical fruit and vegetables. Late afternoon sees the Cairns Esplanade come alive with a flurry of people out for evening jogs, sharing ice creams, cooking dinner on the free barbeque facilities or wandering past restaurants deciding where to dine. There are free group fitness activities throughout the day; hundreds converge to dance simultaneously at Zumba in the park or splash in the lagoon at aqua aerobics. Each Sunday Market Park becomes a bustling bazaar filled with jewellery stalls, local handicrafts and tasty treats. Crush your own sugarcane juice on a bicycle or scour the markets snacking on a fresh coconut halved and filled with your choice of banana and nectar or salad. Macrossan Street in the town centre is brimming with eclectic shops, galleries, restaurants and of course its fair share of pubs where most days you’ll be able to find live music. Join fellow picnickers and watch the sun fade behind the mountains of the Daintree amid a silhouette of coconut trees at Rex Smeal Park, or join a luxurious sunset sail on the tranquil coral sea with Sailaway. Perched atop of the casino is Cairns ZOOM & Wildlife Dome where you can cuddle a koala and zipline over resident crocodile Goliath. The new Cairns Aquarium takes you on a journey through the marine and freshwater ecosystems of Tropical North Queensland showcasing 71 different exhibits. Venture to Kuranda for an interactive wildlife experience with over 500 colourful birds roaming free at Birdworld or wander through the largest butterfly flight aviary in the Southern Hemisphere at the Australian Butterfly Sanctuary. Start your day with Breakfast with the Birds at Wildlife Habitat Port Douglas followed by a wander through their four distinct North Queensland environments showcasing birds, reptiles, tree kangaroos and koalas. Just 25mins south of Port Douglas lies Hartley’s Crocodile Adventures where you can take a boat cruise on Hartley’s lagoon to witness the ancient reptiles in their natural habitat. Despite its name, rest assured you will see other wildlife including koalas, reptiles and birds including the majestic cassowary. Join educational wildlife presentations including feeding shows daily and learn about Australia’s evolution over millions of years with the Gondwana Gateway experience. As the largest urban centre with both domestic and international terminals, Cairns is often referred to the Gateway of Tropical North Queensland. There’s plenty to do within Cairns itself but it also acts as a great base to explore from, with most tours in the region offering a Cairns departure point. Cairns boasts a multitude of both luxury hotel accommodation options as well as budget friendly backpacker hostels. It’s the ideal location to both unwind and get out and about – whether it be venturing into the depths of nature or discovering the city itself. 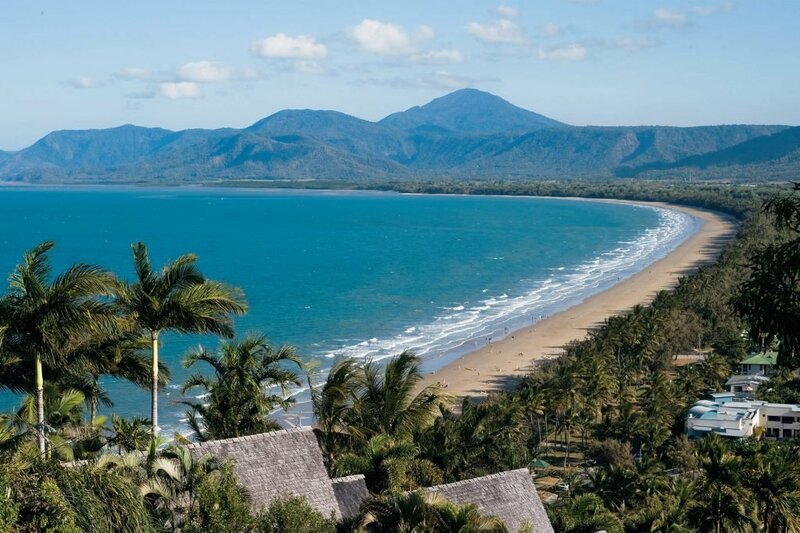 Port Douglas is a recognised flop-and-drop town where it’s rumoured no buildings are taller than a coconut tree and glamorous resorts and boutique accommodation shines. The town breathes relaxation and chilled tropical vibes and is the perfect location to de-stress. Each centre possesses its own unique character and are both worth checking out whether it means staying a few extra days or returning to explore at a later date. Discover the highlights between Cairns, Port Douglas and Cape Tribulation.